If you have Samsung NX Mini and Canon G7X at the top of your consideration list, then you certainly are looking for a mirrorless digital camera that is compact, easy to use, and will not break the bank. Indeed, Samsung NX Mini and Canon G7X are very budget-friendly if you compare them to many other mirrorless digital camera models. Canon G7X is priced around five hundred dollars, whilst Samsung NX Mini is usually even cheaper. 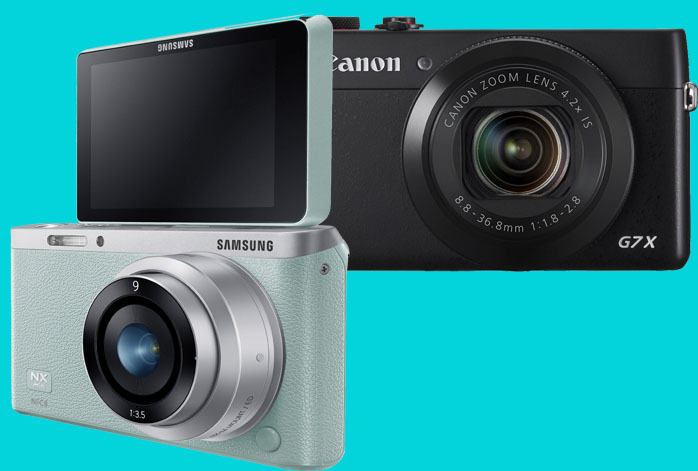 Now, you are wondering whether you should get Samsung NX Mini or Canon G7X. We will answer your answer here! Coming from the famous Samsung NX series, Samsung NX Mini serves as a very compact and portable smart camera. Like its siblings, Samsung NX Mini puts its smart features as one of the key features. It comes with built-in Wi-Fi and will allow you to directly upload your photos and videos to social media or share them via email, AllShare, DirectLink, or MobileLink. With the Remote Viewfinder PRO, you can control the camera from a distance through your smartphone. Guess what? You can even use it for baby monitoring! Besides offering extensive functionality, the 20.5MP-powered camera also offers decent performance and output quality. For videos, it can record in Full HD 1080p at 30 fps. It also offers a higher maximum ISO of 25600, and an exceptional maximum shutter speed of 1/6000s. Combined with the 6 fps photo burst feature, it has some edge to provide sharpness and details even though the photo object is moving. It has built-in panoramic photo feature that stitches multiple shots into one long picture, an external flash shoe, and a large battery capacity that is rechargeable via USB. With 20.2MP CMOS sensor and Canon’s powerful DIGIC 6 Image Processor, also offers decent image quality. Notably, it can record Full HD 1080p videos at 60 fps, offering a very smooth visualization. Additionally, it also offers a continuous shooting speed of 6.5 fps, though the maximum shutter speed is nothing astonishing with only 1/2000s. Unfortunately, It has no external flash shoe. The battery life is quite shorter, and the maximum ISO is only 12800. But it has in-camera image stabilization system that can reduce the effects of camera shake especially at a low shutter speed. Before we conclude it, let us also see Sony a5100 vs Canon G7X. To conclude the product comparison, we announce Samsung NX Mini as the winner. Canon G7X may have better video frame rate and image stabilization, but Samsung NX Mini brings more versatility and adjustability that allow it to not only deliver greater images, but also perform many more things.